Universities must do more to admit students from deprived backgrounds, higher education minister Bill Rammell has said. 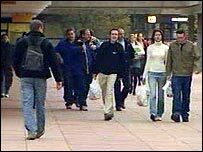 In 2005/06, £386m was spent on widening participation, improving retention rates and helping disabled students. While universities say progress has been made, government figures show an upward trend in poorer student numbers has levelled off since 2002. Mr Rammell now wants all outreach activities to target deprived groups. Speaking at a conference in London, Mr Rammell called on universities to help overcome the real and perceived barriers poorer youngsters faced in getting to and succeeding in higher education. "We need to think about how to close social class gaps at every stage of the education system," he said. He was responding to a report by the Higher Education Funding Council for England (Hefce), based on questionnaires completed by universities. It found 89% of the institutions surveyed said progress in widening participation over the past four years had been strong. But it said while there was "overwhelming" evidence that wider participation programmes were raising aspirations, there was "weak" evidence of raised attainment and access. It did acknowledge that some questionnaire answers may have been understated or overstated, and therefore a more rigorous measurement of progress was needed. Currently an outreach programme called Aim Higher runs summer schools, campus visits, mentoring and develops partnerships between colleges and local schools. It aims to attract students from all backgrounds including children in care, white working-class boys, disabled people and first generation entrants to higher education. But Mr Rammell now wants to set up at least 10 new partnerships between universities and schools designed to help gifted young people from deprived backgrounds to get into some of the country's most prestigious universities. He will also work with the Royal College of Veterinary Surgeons, Engineering Council UK and the Royal Society of Chemistry on projects aimed at overcoming barriers to professions for poorer students. A working group involving Hefce and the Learning Skills Council will look at the problem of limited access to higher education in some parts of the country. The increasing cost of studying at university has led to more students opting to study closer to home to save money. Professor Drummond Bone of the vice-chancellors' group, Universities UK, welcomed the minister's comments but said universities were not necessarily responsible for the differential participation rate in higher education. Increased access depended on increasing staying-on rates at 16, he said. "We must also not forget the importance of increasing opportunities for higher education participation amongst mature and work-based learners." The University and College Union said, for widening participation to really succeed, potential students must have access to the courses they want to study and not be stopped, or put off, by huge debts. UCU General Secretary Sally Hunt said: "The increasing cost of studying at university has led to more students opting to study closer to home to save money. "We cannot allow a system where students feel they have to restrict their choice of degree because the course they want to study is no longer available." Professor David Eastwood, chief executive of Hefce, said its review showed universities and colleges' long-term commitment to widen participation. "We need to reinforce and nurture that commitment to ensure that everybody who can benefit from higher education, irrespective of background, has the opportunity to do so."